In this approach, an enterprise will have a computer to store and process big data. Here data will be stored in an RDBMS like Oracle Database, MS SQL Server or DB2 and sophisticated softwares can be written to interact with the database, process the required data and present it to the users for analysis purpose. This approach works well for less volume of data that can be accommodated by standard database servers, or up to the limit of the processor which is processing the data. But when it comes to dealing with huge amounts of data, it is really a tedious task to process such data through a traditional database server. 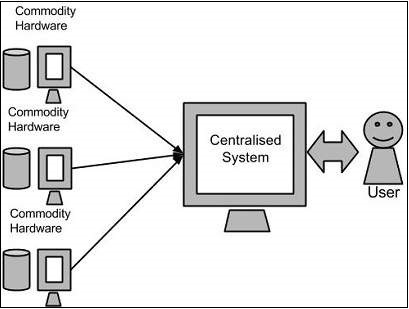 Above diagram shows various commodity hardware’s which could be single CPU machines or servers with higher capacity. Doug Cutting, Mike Cafarella and team took the solution provided by Google and started an Open Source Project called HADOOP in 2005 and Doug named it after his son’s toy elephant. Now Apache Hadoop is a registered trademark of the Apache Software Foundation. 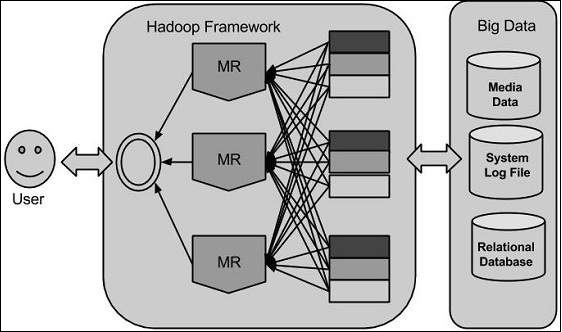 Hadoop runs applications using the MapReduce algorithm, where the data is processed in parallel on different CPU nodes. In short, Hadoop framework is capable enough to develop applications capable of running on clusters of computers and they could perform complete statistical analysis for a huge amounts of data.